MANILA, Philippines – Results are out within 60 days after the exam! 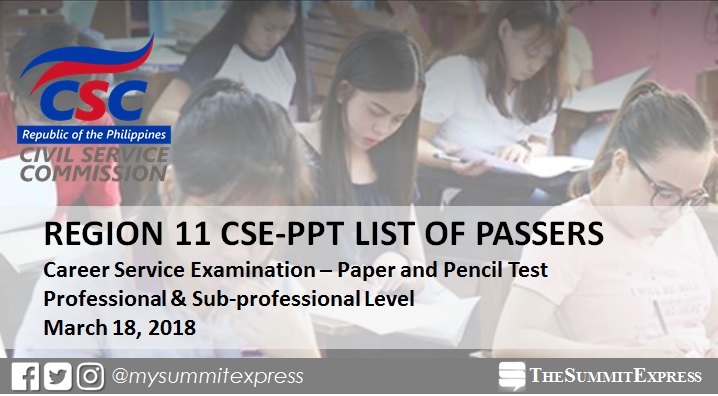 View the list passers of March 18, 2018 Civil Service Exam - Paper and Pencil Test (CSE-PPT) known as the career service exam for Region 11 (Davao Region). CSC announced those who have passed the professional and sub-professional level examinations. Examinees who got at least 80 percent score will be eligible for the first and second level positions in the civil service provided the eligibles meet the qualifications and other requirements of the positions (education, experience, and training). Individual test result generation of the Career Service Examination for CSE-PPT through OCSERGS (Online Civil Service Examination Result Generation System) shall be available 15 days after the release of list of passers. Concerns on examination result, including verification of Examinee Number, should be coordinated directly with the CSC Regional Office concerned. Certification of Eligibility for passers (printed on CSC letterhead, free of charge) shall be available through the CSC Regional Offices approximately 30 days after the posting of the List of Passers or as indicated in the corresponding advisory of CSC. Passers are strongly advised to verify first if their Certification is already available for claiming before going to the CSC Regional/Field Office.